The drop-shoulder style sweater pattern is the simplest one of any sleeve style. The body of the sweater is a simple rectangle. The sleeves also have a shape of a rectangle or are narrowed towards the wrist. The actual length of the sleeve is shorter than a measurement from the wrist to the shoulder. This way the upper edge of the sleeve doesn't reach the actual shoulder line. To assemble a drop-sleeve pullover you will need to join the shoulders of the front and the back parts first. Then taking the shoulder seams as a middle point for the top of the sleeves, sew the sleeves to the body. As an alternative, the sleeves may be picked up along the side edge, and knit or crochet down towards the wrist. Step 1. Do the body measurements. 1) Back and Front (highlighted in yellow). BC = 1/2 (Bust Circumference OR Hip Circumference) + 1 cm = 1/2 (BS/2 or HC/2) + 1 cm. Between BC/2 and HC/2 a greater one has to be chosen. Hence: BC = 1/2 (BS/2 or HC/2) + 1 cm = 1/2 x 50cm + 1 cm = 26 cm. AK = (NC/2) /3 = 18 / 3 = 6 cm. AF = (NC/2) /3 + 2cm = 18 / 3 + 2cm = 8 cm. Connect points F and K with a smooth curve. Back neck line: AK = (NC/2) /3 = 18 / 3 = 6 cm. 2) The Sleeves (highlighted in white). KL = Arm length + Neck-shoulder length = AL + NSL = 56cm + 13cm = 69cm. DN = Bust circumference + 5 cm = BS/3 + 5cm = 48cm/3 + 5cm = 21cm. Its simple pattern makes it easy to calculate increases and decreases while crocheting or knitting. You can start the sleeves either from the shoulder and to continue to wrist or start from wrist and finish at the shoulder. 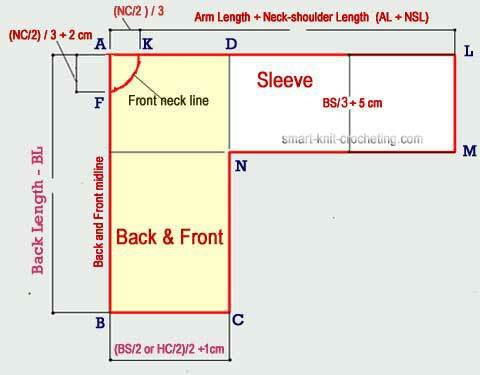 Both methods allow you easily to calculate sleeve length. A simple sweater pattern also make it easy to center stitch or color patterns without concern for interruptions. 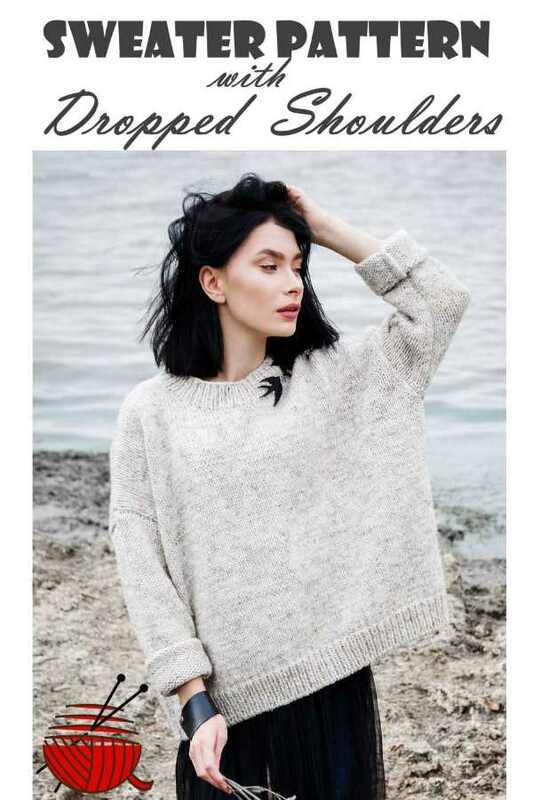 The drop shoulder sweater pattern is a forgiving design because the seam between body and the sleeve is not expected to lie at the shoulder joint and tends to hide an imprecise fit of a sweater. At the same time using a pattern with the drop shoulders, you should take into account that the drop-shoulders garments for the most cases require loose-fitting to make them comfortable. Sometimes it gives a garment over sized look and makes you look broader than you actually are. But once you know about this design feature, your creativity can change it to compliment your body instead. Like in this Cardigan Sweater for example.